More than 30 journalism organizations added their names to an image symbolizing solidarity with the staff of Charlie Hebdo. News organizations worldwide faced a dilemma about how to portray cartoons of Muhammad by the satirical French newspaper Charlie Hebdo after a deadly attack on its offices Wednesday. Some chose to respond by censoring or cropping out photos of the cartoons themselves, Rosie Gray and Ellie Hall reported for BuzzFeed. 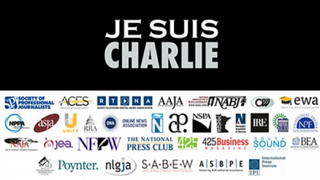 More than 30 journalism organizations throughout the United States, including the journalist organizations of color, added their names to an image symbolizing solidarity with the staff of Charlie Hebdo, as Benjamin Mullin reported for the Poynter Institute. "The text directly above the image, 'Je Suis Charlie,' translates to 'I am Charlie,' an expression of fellowship that caught fire in the hours after the shooting when it was adopted by media outlets and social media users," Mullin wrote. It was not the only number of people killed on Monday — 12 — that ignited the outrage. The same day in Yemen, the BBC reported that "At least 37 people have been killed and 66 others injured by a bomb blast outside a police academy in Yemen's capital, Sanaa, police say." Officials in Burundi, in Southern Africa, said Monday that the army had killed 95 rebels who poured across the border from eastern Congo last week, the Voice of America reported. Preparations were under way for more killing, in an offensive against Rwandan rebels in the eastern Democratic Republic of Congo, the United Nations said. Neither the Yemeni or southern African developments received much media attention. President Obama underscored why Paris resonated. He "called Wednesday's deadly shooting at a satirical newspaper in Paris 'cowardly evil attacks' on journalists and a free press and vowed to help France pursue the terrorists who went on the run," the Associated Press reported.
" 'The fact that this was an attack on journalists, attack on our free press, also underscores the degree to which these terrorists fear freedom of speech and freedom of the press,' Obama said from the Oval Office during a meeting with Secretary of State John Kerry and Vice President Joe Biden. . . ."
That the perpetrators reportedly shouted "God is great" in Arabic tied the Paris killings to Islamic terrorism, and the Council on American-Islamic Relations was quick to denounce it. "We strongly condemn this brutal and cowardly attack and reiterate our repudiation of any such assault on freedom of speech, even speech that mocks faiths and religious figures," CAIR National Executive Director Nihad Awad said. "The proper response to such attacks on the freedoms we hold dear is not to vilify any faith, but instead to marginalize extremists of all backgrounds who seek to stifle freedom and to create or widen societal divisions. "We offer sincere condolences to the families and loved ones of those killed or injured in this attack. We also call for the swift apprehension of the perpetrators, who should be punished to the full extent of the law." Mekahlo Medina, president of the National Association of Hispanic Journalists, said in a Facebook message, "The terrorist attack in France was not only a despicable, cowardly act on innocent people but it was also an attack on an idea — the idea that free people have the right to a free press and free speech without fear of reprisal. "#NAHJ stands not only behind that notion but with every journalist from all stripes who believe in the freedom to criticize, question and demand the truth." The dilemma for media outlets was whether to show the offending cartoons. Erik Wemple wrote in the Washington Post, "In its breaking news coverage of the Paris killings at Charlie Hebdo magazine, 'Fox & Friends,' the morning show of Fox News, showed a shot of one of the magazine's controversial cartoons. "Yet the network, according to a spokeswoman, has 'no plans' to show further examples. Fox News's decision falls in line with those of other cable news outlets. As reported earlier here and here, CNN has cropped out the provocative drawings from its coverage of the killings. And in an extensive rundown of the news media's approach to the matter, Rosie Gray and Ellie Hall of BuzzFeed note this policy at the NBC family: 'Our NBC News Group Standards team has sent guidance to NBC News, MSNBC, and CNBC not to show headlines or cartoons that could be viewed as insensitive or offensive.' "
"Here's what's actually 'insensitive': To attempt an explanation of what may have prompted these killings without showing what may have prompted these killings." BuzzFeed reported, "In the United Kingdom, The Telegraph blurred out one of the depictions of Muhammad, which appeared on the cover of Charlie Hebdo . . .
"The Telegraph also used a tightly cropped image of Stéphane Charbonnier, the director of Charlie Hebdo known as Charb, who was killed in the attack by masked gunmen who attacked the offices of the newspaper on Wednesday . . .
"Three images of Charb were released on the AP wire after the shooting, and none of them included a photo of the cover itself. . . . one shows Charb holding the cover of a 2012 issue of Charlie Hebdo that depicted Muhammad inside, but crops in close to his face . . .
"AP spokesman Paul Colford told BuzzFeed News, 'You're correct: None of the images distributed by AP showed cartoons of the Prophet Muhammad. It's been our policy for years that we refrain from moving deliberately provocative images.' . . ."
Meanwhile, Jamey Keaten and Elaine Ganley reported for the AP, "Police hunted for three heavily armed men with possible links to al-Qaida in the military-style, methodical killing of 12 people Wednesday . . .
"France raised its terror alert system to the maximum — Attack Alert — and bolstered security with more than 800 extra soldiers to guard media offices, places of worship, transport and other sensitive areas. Fears had been running high in France and elsewhere in Europe that jihadis returning from conflicts in Syria and Iraq would stage attacks at home. "French brothers Said and Cherif Kouachi, in their early 30s, should be considered armed and dangerous, according to a police bulletin released early Thursday. Mourad Hamyd, 18, surrendered at a police station in Charleville-Mezieres, a small town in France's eastern Champagne region, said Paris prosecutor's spokeswoman Agnes Thibault-Lecuivre. . . ."
Dart Center for Journalism and Trauma: . . . tip sheets and other resources for journalists covering this tragedy. "Intel is throwing down the gauntlet when it comes to championing workplace diversity," Roger Cheng and Ben Fox Rubin reported Tuesday for CNET. "CEO Brian Krzanich capped off his keynote address at the Consumer Electronics Show with a vow to invest $300 million in an effort to support more representation in technology and gaming. Further putting his own money on the line, he said that he would tie executive compensation to the progress on building a more diverse work force. "It's the boldest move yet by a technology company to address the issue of a lack of diversity in the workplace. The issue has risen in prominence as a result of several incidents, from Microsoft CEO Satya Nadella's suggestion that women shouldn't ask for raises or promotions, to a spike in threats against female gaming developers, and a number of company diversity reports showing that white males still dominate the tech work force. "As a result of Nadella's comments, Microsoft has opened up a dialogue internally about the issue of 'unconscious bias,' and the CEO has pledged to work on better representation. "On Tuesday, Krzanich promised that his company would reach full representation at all levels by 2020. He said he would significantly increase the hiring, progression and retention of women and minorities. Like Microsoft, Intel plans to be open about the progress of its efforts. "Roughly 45 percent of Intel's work force is made up white males, according to the company's latest diversity report. More than three quarters of the company is made up of men. . . ."
"Award-winning sports editor Leon Carter has been named vice president and editorial director for ESPN’s upcoming site headlined by Jason Whitlock," the sports columnist, ESPN announced on Wednesday. The site, known informally as the "black Grantland," "will provide in-depth commentary and insight on race and culture through the lens of sports. In his new role, Carter will oversee all editorial content and the site's staff; he will also assist in implementing the overall vision of the site, reporting to Whitlock, the site’s editor-in-chief. "Carter joined ESPN in 2010 as a vice president and executive editor of ESPNNewYork.com, a one-stop, digital news and information destination for New York sports. For the past year, he has also been responsible for other ESPN.com local sites in Boston, Dallas, Chicago and Los Angeles." Carter was sports editor of the Daily News in New York from 1999 to 2010. The release also said, "In addition to Carter, Brando Simeo Starkey, a 2008 graduate of Harvard Law School and an accomplished legal writer and author on social issues, joins the new ESPN site as an associate editor based in Southern California. Starkey is a member of the New York State Bar Association and the author of 'In Defense of Uncle Tom: Why Blacks Must Police Racial Loyalty,' an insightful analysis of the epithet and its impact on racial loyalty among African Americans, to be released in February 2015. . . .
"Carter and Starkey are the most recent additions to the editorial team for the ESPN site by Whitlock on issue-based journalism. In August, ESPN announced the arrival of former Ebony magazine editor-in-chief Amy DuBois Barnett as executive editor of the project. In November, the company hired writers Jesse Washington, Danielle Cadet and Ryan Cortes for the site, followed by Mike Wise, Jerry Bembry and Justin Tinsley joining the team in December." Washington Rises to Deputy Director at Online News Assn. "It's with great pleasure that we announce Irving Washington has been promoted to Deputy Director," the Online News Association reported Wednesday. In his new role, Irving will act as ONA's second-in-command and a key contributor to short- and long-term planning and strategy, responsible for all operations, academic programs and professional awards. "In his role as Operations Director over the past two years, Irving has helped oversee administration, HR, budgeting and all conference and event logistics and platforms. He has also been responsible for the administration — and success — of our scholarship programs, including the $1M Challenge Fund for Innovation in Journalism Education, the MJ Bear Fellowships, the Knight HBCU Scholarships and the AP-Google Scholarships. . . ."
The release also said, "As a media diversity advocate, Irving has managed programming and fundraising initiatives for journalists, media professionals and students nationwide. As program manager for the National Association of Black Journalists, he created new partnerships for its student programs, which annually gave over $100,000 in scholarships. He also launched the organization's all-digital platform for the annual Salute to Excellence National Media Awards, the largest journalism awards competition recognizing issues affecting the worldwide black community and African diaspora. . . ."
"Want to influence a casino bid? Polish your corporate image? Not be labeled a racist? Then you need to pay Al Sharpton," the story by Isabel Vincent and Melissa Klein said. But Sharpton told Journal-isms by telephone Wednesday that among the contributors to his National Action Network has been News Corp, the parent company of the Post. Another has been Bill O'Reilly, star of the Fox News Channel, also owned by News Corp. The company bought tickets to the National Action Network convention, giving the tickets to conservative commentators to attend on its behalf. O'Reilly gave $25,000 to help children at Christmas. "Why are you writing a story when your leading star gave us $25,000 and you're buying tickets, too? Where's the shakedown?" Sharpton asked. The ticket purchases were reported Tuesday by Evan Gahr in the Daily Caller. A New York Post spokeswoman did not respond to a request for comment. Sharpton also denied an assertion by Luke Mullins in the January issue of Washingtonian magazine that creating Sharpton's MSNBC show "PoliticsNation" was part of an effort to win federal approval for Comcast's takeover of NBC. "When we sat down with Comcast," the National Urban League, the NAACP and Sharpton asked for four television networks for African Americans, two of which went to Magic Johnson and Sean Combs, he said. Two are still unassigned. Why would he settle for a show when he could have bargained for a television network? Sharpton asked. "The assumption of stupidity is fascinating to me." "Over the past week there has been a major debate over the film 'Selma,' " Alvin B. Tillery Jr., associate professor of political science at Northwestern University, wrote Monday for the Washington Post. "The film's depiction of President Lyndon Johnson as a tepid supporter of African-American voting rights and an opponent of the organizers of the Selma march has raised the ire of the surviving members of Johnson’s coterie and rankled political historians. In particular, Joseph Califano argued on the basis of a phone call between President Lyndon Johnson and King that 'Selma was [LBJ’s] idea.' Needless to say, Califano’s overreach has been relentlessly mocked on social media. "In 2009, the late Hanes Walton, Jr., of the University of Michigan and I initiated a study on how presidents were portrayed in African-American media. We gathered and examined thousands of editorials about presidents that appeared in five black newspapers between 1900 and 2012: the Atlanta Daily World, Chicago Defender, Los Angeles Sentinel, New York Amsterdam News, and the Pittsburgh Courier. We selected these papers because of their national circulations, regional market positions, and the partisan diversity of their editorial boards. "Our goal is use these editorials to rank modern presidents on the issues important to the African-American community. While the project’s work continues, we have completed our examination of the editorials that span the Civil Rights era. "Our results show that of the five presidents between 1948 and 1972, Johnson had the highest approval ratings among the editorial boards of these newspapers. Astoundingly, all 34 of the editorials on Johnson’s civil rights record that ran in these five papers during his administration evaluated him positively. "To be clear, the editorial boards of these papers were not easy sells on the civil rights issue. Approval of Johnson exceeded that of Truman, who was popular with African Americans for desegregating the military through executive action. And Eisenhower, Kennedy, and Nixon were not evaluated positively for their civil rights record in even half of editorials. . . ."
"While Michael Brown and Eric Garner are not the first unarmed Black people to lose their lives after questionable encounters with White police officers, their deaths — followed by the stunning, back-to-back failures of two grand juries to indict the men who killed them — have been a flash point," Essence announced Tuesday, promoting its February issue hitting newsstands on Friday. "ESSENCE invited activists, authors, thought leaders and cultural figures to reflect on the meaning of this moment…and what we must do next. (Page 88) Plus, ESSENCE launches CIVIL RIGHTS WATCH, a new series which will chronicle — and call out — significant gains, losses and solutions in this evolving movement . . ."
The issue is Essence's first "cover blackout," without a cover image. Can the New Republican Congress Deal With Indian Issues? "In our lifetimes, Indian Country has had a somewhat rocky romance with the Republican Party," Philip Baker-Shenk and Paul Moorehead wrote last week for the Indian Country Today Media Network. "Now, in the wake of the 2014 mid-term elections, Indian Country will once again be living with a Republican-controlled Senate and House. It's been 15 years since a Democratic president faced that reality. Last month's Republican wave put the GOP back in charge of the U.S. Senate with a solid 54-seat majority over 44 Democrats and two independents. That wave also gave the GOP a 247 to 188-seat majority in the U.S. House, its largest margin since 1928. . . ."
Baker-Shenk and Moorehead also wrote, "Yet Native American voters still tilt heavily Democratic at the ballot box. Many Tribal leaders appear to be much more comfortable with Democratic politicians than with Republican politicians. Democratic operatives more easily dismiss the anti-tribal views of some Democrats as harmless aberrations than do Republicans with their Indian-fighter outliers. "As two guys who have worked for Republican friends and allies of Indian Country, we've asked ourselves — why is it that some Republican politicians still seem to get awkward when they step into Indian Country? . . ."
"A delegation of journalists from the US-based National Association of African Journalists (NAAJ), who are concerned about a successful democratic transition and the entrenchment of democratic principles, has arrived in Nigeria for the national elections scheduled for February 14 and 28," the group said Wednesday in an announcement. "Members of the 10-year-old organization will be in Nigeria throughout the elections, and also plan to conduct training sessions for Nigerian Journalists covering the elections. "Ita, a Nigerian-born former Assistant City Editor at Cox-owned Springfield News-Sun in Ohio, is joined by Ben Edokpayi, former editor of The Dixon (Calif.) Tribune and Oladimeji Abitogun, editor-in-chief of sharpedgenews.com. The final batch will join the NAAJ team about a week before the elections. . . ."
Gabriel Snyder, who became editor-in-chief of the New Republic magazine amid a recent staff exodus, has hired three people of color, making good on his promise to diversify the traditionally non-diverse staff. According to Benjamin Mullin of the Poynter Institute, Snyder has hired Jamil Smith, an MSNBC producer who has worked on both "The Rachel Maddow Show" and "Melissa Harris-Perry," as a senior editor; Bijan Stephen, who joins as an associate editor tasked with editing the website and writing, most recently an editorial assistant at Vanity Fair; and Cathy Park Hong, who will be poetry editor. She teaches poetry at Sarah Lawrence College. Gavin Sutton, a radio journalist who worked in New Orleans, Orlando, Newark, N.J., Detroit and New York, died "suddenly" at his New Orleans home Monday at 50, his brother, veteran journalist Will Sutton, said. "Don't know the cause. Waiting for autopsy results. He had not been ill. We're stunned," Will Sutton messaged. Gavin Sutton worked at ABC radio as an editor, producer and writer in New York and more recently was a volunteer at WRBH-FM, a nonprofit New Orleans radio station for the blind and print disabled. A Mass of Christian Burial is scheduled for Saturday at noon at Our Lady Star of the Sea Catholic Church, 1835 St. Roch Ave., New Orleans. Visitation is at 10:30 a.m., with reflections at 11:15 a.m. Will Sutton Facebook tribute. Jean Quan, who is leaving office after one term as mayor of Oakland, Calif., "was Oakland's first Asian-American mayor. She was the first woman to hold the city's top elected public office as well as the first Asian-American woman to head a major U.S. city," Tammerlin Drummond wrote for Sunday's Oakland Tribune. But she "was hurt by her inability to communicate effectively, awkward social skills and polarizing personality. . . . The East Bay Express wrote recently that some journalists 'seemed to delight in pointing out her (Quan's) every misstep, regardless of how inconsequential.' . . ."
"Several sections of potential Republican presidential candidate Dr. Ben Carson's 2012 book America the Beautiful were plagiarized from various sources, BuzzFeed News has found," Andrew Kaczynski, Ilan Ben-Meir and Megan Apper reported Tuesday for BuzzFeed. "In many cases Carson cites the works that he plagiarizes in endnotes, though he makes no effort to indicate that not just the source, but the words themselves, had been taken from different authors. . . ." However, Bill Federer, one of the authors cited, told Joel Gehrke of National Review Online on Wednesday, "In my estimation, he has used my material exactly the way I wanted my material to be used." "Nicholas Subtirelu, a PhD student in linguistics at Georgia State University, was thinking about his own generation's rejection of once-acceptable racial labels when he decided to study the changing use of those labels in journalism," Lene Bech Sillesen wrote Monday for Columbia Journalism Review. "More specifically, how racial labels have changed in The New York Times between 1851 and 2014, which is the timespan of the Times' online Chronicle tool that allowed Subtirelu to track the paper's historical usage of various words. "I think the changes in racial labeling practices over time really impresses upon us that racial groups are social constructs, and not straightforward reflections of biology," Subtirelu says. "Journalists play an important role in shaping how we categorize other people." CJR published selections from Subtirelu's research. "The website of the Georgia Civil Rights Cold Cases Project at Emory University is now live at http://coldcases.emory.edu," Hank Klibanoff, an Emory journalism professor, annnounced on Tuesday. "The site showcases the research and writing of some of the 50 Emory University undergraduate students who have been examining Georgia history through the prism of unsolved and unpunished racially motivated murders from the modern civil rights era. . . ."
"Gregory H. Lee Jr., former president of the National Association of Black Journalists, will co-chair a new UNITY: Journalists for Diversity advisory council, UNITY president Russell Contreras said Thursday," Tracie Powell reported Wednesday for alldigitocracy.org. "The council will help shape short-term and long-term strategic goals, providing a blueprint for growth for the troubled journalism alliance. . . "
"New York Times executive editor Dean Baquet, in a wide-ranging memo to staff sent Tuesday morning, looked back on the challenging year that was 2014, and laid out a vision for the paper's future going forward," Jeremy Barr reported Tuesday for capitalnewyork.com. Barr quoted Baquet: "We will fix the things the buyouts broke," he said. "We will look internally to fill important jobs. We will carefully and judiciously make a few outside hires. I know it seems incongruous to hire after reducing the staff. But if we stop bringing in new talent we run the risk of missing a generation of future stars." "A new FAIR study finds that torture defenders outnumbered critics of torture by nearly 2 to 1 in TV news coverage of the Senate Intelligence Committee report released on December 9," Fairness & Accuracy In Reporting reported Wednesday. "FAIR surveyed the guests of nine news programs for the week of December 7 to December 14, when discussion of the torture report's findings was most prominent. . . ."
"BuzzFeed News announced Tuesday that Melissa Segura will be its first investigative fellow," Kristen Hare reported Tuesday for the Poynter Institute. "Segura has reported at Sports Illustrated and SI.com since 2001, when she was a college intern." Hare also wrote, "In October, BuzzFeed announced the one-year fellowship along with the Columbia University Graduate School of Journalism with the intention of bringing a more diverse pool of journalists into the investigative field. . . ."
Broadcaster, photojournalist and newspaper reporter made careercast.com's list of the "Most Stressful Jobs of 2015." The Committee to Protect Journalists said Tuesday it "condemns the arrest of the owner of a Bangladeshi TV channel, which was unavailable in several parts of the country a day after airing a speech by an exiled opposition leader. Police today entered the Dhaka offices of Ekushey TV, a privately owned channel that covers local and national news, and arrested Abdus Salam, the owner of the channel, according to local news reports. . . ."